After their talks in Sochi, Putin and Zuma signed eight agreements covering education, energy, defence, fisheries, mineral resources, transport and science and technology. Amid unprecedented warming of bilateral relations in recent years, South African President Jacob Zuma paid a working visit to Russia, last week, to hold wide-ranging talks with his Russian counterpart Vladimir Putin at the Black Sea resort of Sochi to strengthen trade and investment ties between the two countries. Zuma’s Russia visit was a continuation of the bilateral talks the two leaders had during the Durban summit of the BRICS countries (Brazil, Russia, India, China, South Africa) in March, which they were not able to complete as they had too short time because of their heavy engagement schedules with BRICS summit leaders. Then Zuma and Putin had agreed to continue the dialogue during the South African President’s visit to Russia in May so that all the matters of the agenda could be completed. “We were able to address a whole range of current issues in further strengthening Russian-South African ties,” Putin said at a joint press conference after his talks with Zuma on May 26. He, in particular, noted the” regularity” of Russian-South African bilateral political dialogue “effectively complemented” by bilateral cooperation in leading international and world organizations and structures, including BRICS forum, the G20 and the UN. Since Zuma’s first visit to Moscow, in August 2010, during Dmitry Medvedev’s presidency, the political dialogue between Russia and South Africa, has continuously been gaining momentum. In fact during Zuma’s visit, the Kremlin for the first time positively hinted its readiness to improve its relations with a number of African countries, in the backdrop of its starting a strategic partnership with South Africa. In a sign of fast developing ties between the two countries, Zuma paid his second visit to Russia in July 2011. In a clear break from the past, the Moscow’s move was highly welcomed by Zuma and the two countries have never looked behind ever since. The recent meeting in Sochi, was the third between Putin and Zuma in less than a year, and the third visit of Zuma to Russia. The two Presidents will see one another again at the G20 summit in Saint Petersburg in September. Russia’s economic ties with South Africa, the continent's leading economy, have been burgeoning over the last few years. After their talks in Sochi, Putin and Zuma signed eight agreements covering education, energy, defence, fisheries, mineral resources, transport and science and technology, in line with all the relevant legal instruments and mechanisms, including the Declaration of Strategic Partnership between Russia and South Africa signed in March. The trade turnover between the two countries, in 2012, increased by 66 percent and since January 2013 a growth of over 17 percent has been recorded. “The absolute figures are still modest, but we have every reason to believe we are moving in the right direction,” Putin said at the joint press conference. “Another key objective is to step up investment cooperation. This will certainly make our joint work more stable, the number of joint projects in all areas is growing” he added. So far, Russian companies have invested over $1 billion in South African economy, including the mining industry, energy and machine engineering. Putin also promised to provide Russia’s assistance in creating a comprehensive nuclear energy industry in South Africa. In aircraft engineering, Russia is planning joint production of a light multi-role helicopter. A regional maintenance centre for Russian helicopters has launched operations in Johannesburg and talks are underway on supplying Russian passenger jets to South Africa.The two countries have also mulled the creation of a platinum cartel on the model of OPEC cartel which controls oil supply. Putin also pointed out to the positive outcome of the cooperation between the two countries as the member-states of BRICS forum. South Africa joined the BRIC forum in 2011. Russia is convinced that its cooperation with South Africa within BRICS will cement bilateral ties between the two countries. “We also discussed expanding our cooperation within BRICS. We intend to transform this group into a full-fledged mechanism for cooperating on global economic and political issues,” Putin said. 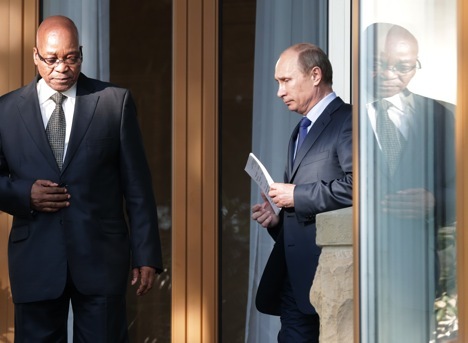 For his part, Zuma expressed his happiness and satisfaction over the results of his talks with Putin. “As President Putin has indicated, we discussed bilateral matters, particularly at the level of economic cooperation and how to take advantage of the BRICS cooperation and the area that opens for us, the two countries, how to take advantage of that to deepen our relations at all levels,” the South African President said. Zuma added that as partners in BRICS, Russia and South Africa need to have “a lot in common.” “South Africa’s membership to BRICS to us, it means, in a way, Africa’s membership to BRICS. And therefore that is actually very important,” he noted. It is worth mentioning that South Africa was invited to join the four emerging economies of Brazil, Russia, India and China (BRIC) as it had independently developed economic relations with all the BRIC countries. Besides India and China, it has also historical links between Russia and the South African ruling party. The trilateral development move between India, Brazil and South Africa (IBSA) had also its own importance, increasing the bargaining power associated with all respective member-states, especially South Africa within the BRICS group of countries. Russia recognizes the economic achievements of South Africa, as it is the largest economy on the African continent with a GDP constituting 50 percent of the aggregate GDP of other sub-Saharan African countries. Russia’s economic interaction in the framework of BRICS forum and with South Africa as a member-state is closely linked with the G20 agenda as Moscow focuses on cooperation on issues aimed at reforming the international monetary and financial systems, including completing the current stage of IMF reforms on the terms and conditions agreed in the framework of the G20, as well as continuing reform of the international monetary and financial systems to create a more representative, stable and predictable system of international reserve currencies. At the same time, Russia has emphasized the importance of BRICS cooperation within the G20 to strengthen the latter as a financial and currency crisis resolution centre and as a main instrument to reform the global financial and economic systems. During the talks with Putin, Zuma stressed that Russia-South Africa cooperation was not only necessary within the BRICS forum, but also within the G20. “We also need to act in the forum of G20, where we discuss international issues and ideas,” he said at the joint press conference, while referring to the interaction between Russia and South Africa within the BRICS. Putin also said that in September, a G20 summit will be held in St Petersburg where complex pressing problems faced by the global economy will be discussed. He welcomed the suggestion by Zuma to invite representatives from the African countries to St Petersburg. “I would like to say that we really appreciate the suggestion, this initiative, and we are ready to welcome leaders from the African Union (AU) and the New Partnership for Africa’s Development (NEPAD) to the G20 summit. According to the Russian experts, if member-states take a joint position on some matter within the BRICS format, it will have a higher chance of being approved by the G20.